Administer BabyBIG intravenously using low volume tubing and a constant infusion pump (i.e., an IVAC pump or equivalent) through a separate intravenous line. If a separate line is not possible, it may be "piggybacked" into a pre-existing line if that line contains either Sodium Chloride Injection USP, or one of the following dextrose solutions (with or without NaCl added): 2.5% dextrose in water, 5% dextrose in water, 10% dextrose in water, or 20% dextrose in water. If a pre-existing line must be used, do not dilute BabyBIG more than 1:2 with any of the above-named solutions. Admixtures of BabyBIG with any other solutions have not been evaluated. 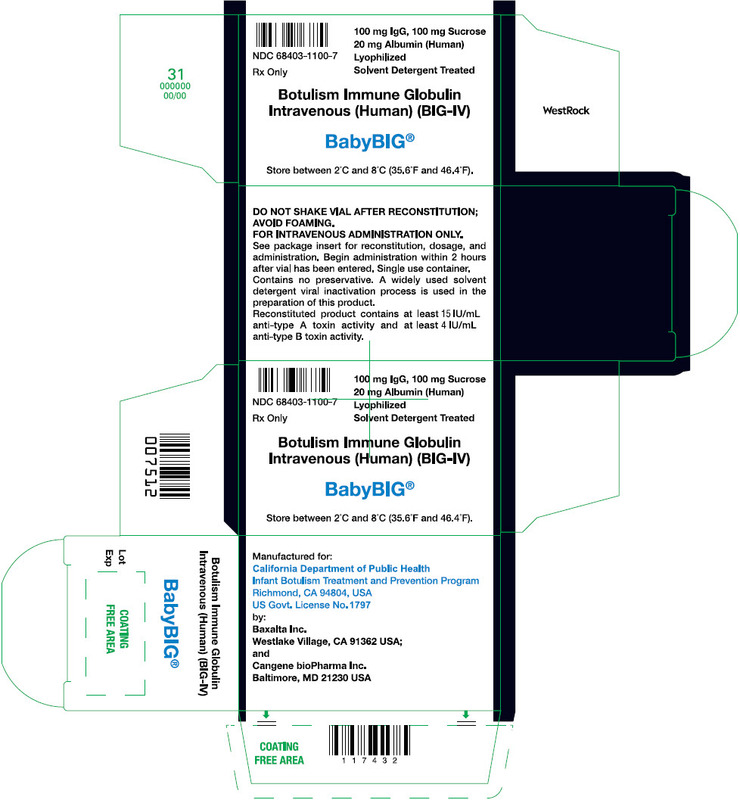 Use an in-line or syringe-tip sterile, disposable filter (18 Î¼m) for the administration of BabyBIG. • Both Gammagard 5% and Gammagard S/D 5% were used as placebo in this study. • Day 0 is the day of treatment. • In reference to treatment. • Included hydrophobic chromatography after solvent/detergent treatment. • Both Gammagard 5% and Gammagard S/D 5 % were used as placebo in this study.